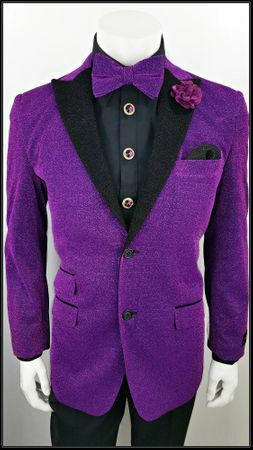 Get up on stage and own the audience by wearing stylish entertainer style blazers and dinner jackets by A.Midnight. These entertainer style blazers are designed it Italy and feature bold styles that are silky and made for the man who need those eyes on him only. This purple glitter fabric blazer has double side vents in the back and can be worn with slacks to dress it up or even jeans to dress it down. Made of fine silky microfiber fabric.